Whether you’re recovering from a food coma, or just now sitting down for dinner, or waking up to so some early Black Friday shopping, I hope your Thanksgiving was full of family, friends and feasting. From my (extended) novel family – Constantine, Julius, Octavia, Aurelia, Aura, Corbus, Regillus, Gwendyrn and more, HAPPY THANKSGIVING! Check back tomorrow for a Black Friday Sale! It is going to be huge! Brass Legionnaire is an Ebook Award Finalist! Happy Thanksgiving! I have a lot to be thankful for! 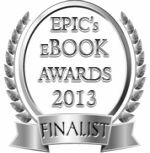 First and foremost, I just learned that my debut novel, Brass Legionnaire, is a finalist in the Action & Adventure Category for the 2013 eBook Awards. The eBook Awards are done by the Electronic Publishing Industry Coalition, and is one of the very first awards for e-publishing. You can learn more about them here. But it isn’t. I’m one of the top three in an entire category, going up against two other more veteran authors with many books and novels out, including last year’s winner of the same category. Oof! But like I said, I’m so overwhelmingly excited just to be mentioned. And I’ve decided I’ll be going to EPICon (The annual conference/awards gala) this year just to see what it’s like to be a published author at an event where everyone is involved with publishing in one way or another. The even is in March, so I’ll be able to update you then on what happened! Plus, I can still hold out hope for an award! And I already know I’ll be submitting Copper Centurion this upcoming year. As always, it never hurts to have a second string in your bow. Happy Thanksgiving! Be sure to eat well and help the cook clean up!